Hooded Eyelids, Dark Circles Under Eyes and Drooping Eyebrows. EYE BAGS: STRATEGY – Emphasis on FlexEffect Facial Resistance Training™ backed-up with Cross Stretching™ (Skin Remodeling). If bags are not caused by allergies, they are more than likely fat deposits under the age-related thinned skin. It was once thought the only way to remove eye bags was surgery. Studies now show continues pressure applied over any fat deposit will cause it to dissipate. Lower eyelids are no exception. HOODED LIDS: STRATEGY – Emphasis on FlexEffect Facial Resistance Training™ and possibly Pressure Reps™ (Bone Remodeling). Hooded lids are caused by eyebrow-drape, thinning of the skin, lax upper eyelid muscle and bone loss. Wrinkles of any kind are generally caused by sun damage and thinning of the skin. EYE HOLLOWS: STRATEGY – Emphasis on Pressure Reps™ (Bone-Modeling) backed-up with Cross Stretching™ (Skin-Remodeling). Generally, Eye Hollows are caused as one begins to lose bone mass. This can be due to age or poor diet. 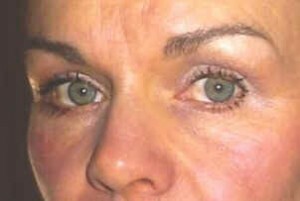 DARK CIRCLES: STRATEGY – Emphasis on FlexEffect Facial Resistance Training™ with Cross Stretching™ and Pressure Reps™. Dark Circles are generally inherited. The increased darkening of the under eye area is due to thinning of the tissue as we age. Extra attention is needed from all FlexEffect training techniques to bring back as much fullness to the tissue as possible. To better understand the training techniques used in FlexEffect Facialbuilding, please visit our web pages on Facialbuilding, Bone Remodeling and Skin Remodeling. 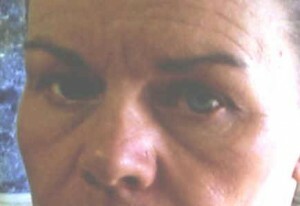 To view more B/A photos of eyes, please visit our Before & After page. Poll Querry: Best Facial Exercise Program for thin, crepe-like under-eye skin, hollow eyes, and dark circles?